When I was dating my husband 16 years ago, he told me to get dressed up because we were going to a fancy restaurant for Valentine’s. I anticipated the evening all week and enlisted the help of my Tias to pick out the perfect outfit. When he arrived, the tias asked where he was taking me. He said with a tinge of excitement, “I was thinking we would head to the Harvest House for dinner”. They looked at each other in a panic. Rookie Mistake. You see, we were living in Atlanta and he didn’t think to make reservations. That evening we were turned away from half a dozen places before reluctantly entering this hole-in-the-wall pizza dive…clearly over-dressed. It was dark, empty, and a bit seedy. My then boyfriend looked so defeated. As it turns out, the thin-crust Margarita pizza was absolutely delicious, the pitcher of beer perfect, and we laughed our way through the evening. It was a tradition in the making. For the past 15 years, while the rest of town is scrambling for reservations, we find a pizza dive on Valentine’s. It feels like our romantic little secret. Our children love hearing the story behind our February 14th tradition. So we embrace the quirky things about our relationship or family, even the missteps, because they often make the richest traditions. I adore Valentines because it comes after the intensity of Christmas and before the spiritual heaviness of Easter. It is fun, flirty, and fabulous. I start wearing red ballet flats beginning February 1st and add a splash of pink any opportunity I get. My husband however believes Valentine’s is a Hallmark created holiday. He is not “a consumer” by nature and believes this is a day where men are guilted into overpaying for flowers and cards. It’s shocking how different we are. So I decided early on, I did not want to be a wife filled with a sense of Valentine’s Entitlement. I deserve a card, flowers, a date night? You know that mindset…what is he going to do for ME? As women, we can create a unspoken standard of expectation. How fun is that for a guy? It’s not. So I simply shifted my focus off of myself and onto delighting him. It is so much more enjoyable and fulfilling. As it turns out, it makes him want to reciprocate, not because he has to, but because it feels good to be shown love. Sometimes, the love just looks different from what we see on commercials. 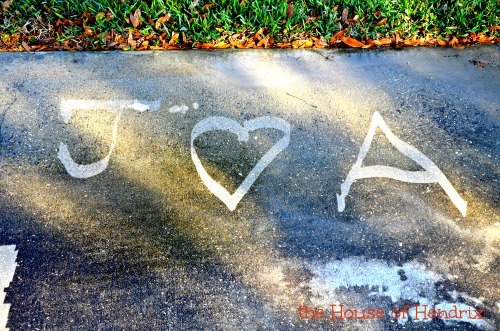 Last week when my husband was pressure washing the driveway, he melted my heart with this. So if you find yourself disappointed by the lack of romance coming your way this year, shift the focus off of yourself. Use the day as an opportunity to show the love, not just receive it. And if you are in a relationship, appreciate the unique gestures from his heart, whether it be pumping up your tires or sending you a text on the way home from work. A man who lavishes gifts does not love deeper than one who does not. Gratitude is always the easiest way to keep entitlement away. Confession: Last year I signed my son’s name on all 15 Valentine’s cards for his classmates. But here’s the thing, I didn’t just sign his name in my regular handwriting. I did it in a ridiculous child-like scribble so it would appear that he had done this himself. Mrs. Geer never suspected a thing. Valentines at school has become quite the festive event. This week as we chose cards to give their friends, my boys said it was “creepy” to say things to their friends like ‘Be Mine, I Dig you, We were meant to be’. They have a funny point. Here are the cards they decided upon which we snagged off of Pinterest. 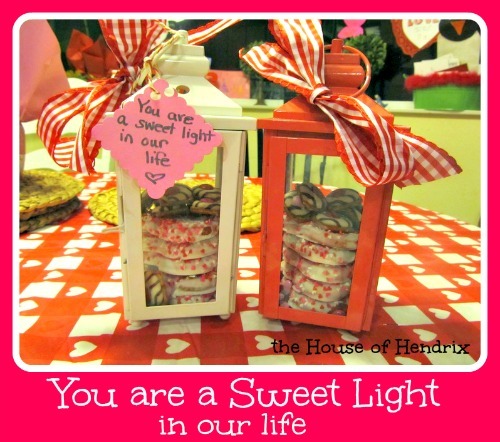 For more Valentine’s ideas, check out our Valentine’s Pinterest board.